Countries where police and paramilitary forces kill with impunity, where the press sings to the rulers tune and journalists who dare to write about what they see are stopped either by force or by threats of legal action are described by the United Kingdoms politicians and media as dictatorships. But in the UK, police officers can kill, safe in the knowledge that they will not be prosecuted for their actions, even if they are found by a jury to have been unlawfully killed. 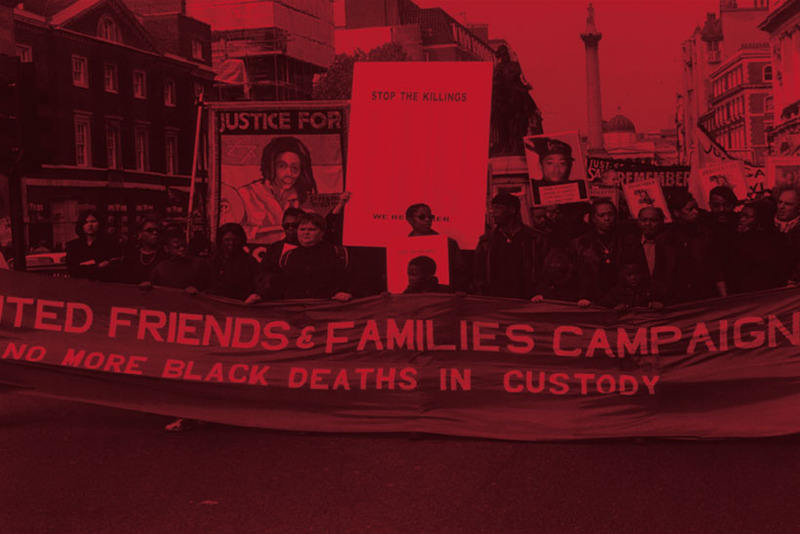 Since 1969 over 1000 people have died in police custody. No police officer has ever been convicted for any of these deaths. INJUSTICE exposes and opposes this outrage. It is a call for justice by the families of the deceased. It is a voice the police are now trying to stop. On 6th July 2001 at 6.30 p.m. INJUSTICE was due to be officially launched at the Metro Cinema in London. In the audience there were many relatives of people who had died in police custody. Some had traveled hundreds of miles for the viewing. The screening was the culmination of seven years of work and was to be the platform for the films national release later in the year. With a run already secured at the Ritzy Cinema and other cinemas to follow, INJUSTICE was breaking ground in putting feature length documentaries on the big screen. Apart from the international press present, there were diplomatic representatives from a number of embassies who were there to find out more about the human rights abuses that the film documents. Reviews had been strong. The Guardian called it "one of the most despairing and powerful films ever made in this country". The Gleaner called it "moving and militant". On the week of the Metro launch the film received Critics Choice in Time Out which called it a "powerful polemical documentary". The ongoing press and television interest in the launch meant that outside the cinema, news crews from all over the world were holding interviews with the filmmakers and the families of those who had died. Many people were meeting for the first time, for some the evening was bringing back memories of how their brother, mother, sister or husband had died. Some of them would be seeing INJUSTICE for the first time so the atmosphere was charged. This was also to be a celebration, and a declaration to the world that the families would not stop fighting for justice. The mood soon changed. At 8.11 p.m. the director of the Metro Cinema received a fax from the lawyers of two police officers. The solicitors threatened the cinema with a claim for substantial damages should it show INJUSTICE. They represented Police Officer Paul Harrison, who was involved in the death of Brian Douglas and Police Officer Stephen Highton, the custody officer when Ibrahim Sey was unlawfully killed. The letter from Russell, Jones & Walker to the Metro Cinema stated: " You should be aware that should your screening go ahead, our clients will have no hesitation in pursuing their rights against your company for very substantial damages that will be their only means of compensation and vindication." The Metro had to decide within minutes whether they should go ahead with the screening. The decision was taken. In the cinema Eva Kirkhope, the director of the Metro stood before a stunned audience and read out the police solicitors letter. Some of the family members burst out crying in disbelief. Others in the audience demanded the cinema go ahead with the screening. Many of them had spent years fighting their case and at every step of the way police solicitors, the press office of the Metropolitan Police Service, the Police Complaints Authority and the Crown Prosecution had effectively gagged their voices. Now they were trying to do it again. The very heart of the film, that the officers responsible should be prosecuted for these deaths, was being threatened. Eva wanted to consult her lawyers but in views of lack of time it was not possible. She was a widow, trying to raise two children and the cinema was her livelihood. As such she could take no risk and pulled INJUSTICE. The film was under attack from the police. As filmmakers we went on national television and spoke about the appalling distress the actions of the police had caused the families that night. We also made the point that no matter how hard they tried the police could never suppress the film which had already gained international interest. As usual the police refused to comment. The next days headlines read: "Film Screening pulled after police legal threat" The Independent and "Death in Custody film halted by police action" The Guardian.
" In a letter which was sent to the Metro Cinema at 6.11 p.m., only 19 minutes before the scheduled screening, Russell, Jones & Walker Solicitors make inaccurate claims about the content of the film. One of the officers they represent is not even named in the film. Out of the three main cases those of Ibrahim Sey and Shiji Lapite resulted in inquest verdicts of unlawful killing. In the third case, that of Brian Douglas, the film presents overwhelming evidence for the prosecution of the two officers involved, one of whom is represented by the solicitors. We are appalled at the bullying tactics that the police have employed to stop the film being shown." Over the next few days Migrant Media booked Conway Hall, run by the South Place Ethical Society. It was important to screen the film urgently and not to bow down to the police threats. Conway Hall were well known to have a policy of standing up for freedom of speech. By now we had engaged David Price Solicitors, a firm specialising in media libel, who had provided a legal opinion that could safeguard Conway Hall in the event that the police try to stop the film again. On Wednesday July 11th families began to gather at the Hall. As the screening time approach people who had come from as far as Manchester, Liverpool and Birmingham arrived. Around 5.45 p.m. Conway Hall started received faxes from Police solicitors threatening legal action against the screening of INJUSTICE. We hoped that they would be able to stand up to police pressure. They didn't. There were around 250 people in the hall at this time. The manager switched on the lights making it impossible to see the film. He informed the audience that he could not show the film because of the legal threats. People were shocked. Many families had been at the Metro the previous Friday and they began to protest, angrily. The manager refused the requests for allowing the screening to go ahead. For some it was the final straw. A cry went out: "Let's occupy the hall". The audience took control of the projector and started running the film. The manager threatened to turn the power off. Some people rushed to stop this from happening. As the struggle between the manager and the audience intensified, around 50 people drifted away from the screening. INJUSTICE continued to be screened, with many people in the audience shedding tears at the suffering and showing pride at the resistance on the screen. Conway Hall called the police. On hearing this, the audience barricaded the doors and continued to screen INJUSTICE. Two police officers arrived a few minutes later but after discussing the situation with them they agreed that it was a civil matter and left without taking any action. Some lights were still on and this affected the quality of the projection. Having to watch families of those killed by police watching a film about the death of their loved ones in these conditions was intolerable. But at the same time there was a feeling of strength and power in the audience. They had taken an important stand not just in support of the film but as a group of people prepared to stand up against police threats. It was a night that many of them said they would never forget. The events of Conway Hall were widely reported: " Audience hijacks hall to see death in custody film" Evening Standard. "Injustice goes ahead, despite threats" Screen International. "Crowd defies death film legal threats" The Metro. The next day we gave television and radio interviews, as always making the struggle of the families central to our arguments. We demanded that the police desist from their actions and allowed people to see INJUSTICE, without intimidation and threats. We have continued to show our film wherever people have asked us to and will continue to do so. Even before the police's attempts to suppress the film it had already been screened in London. On Thursday 5th April 2001, INJUSTICE was shown at the Ritzy Cinema in Brixton. It was fitting that the film was had its pre launch in an area of London in which Brian Douglas, one of the men killed by police and featured in the film, grew up and lived. It was also the 20th anniversary of the Brixton uprisings when Black youth had taken to the street and rebelled against police that had been harassing them. INJUSTICE was being screened as the closing night film for the US based Human Rights Watch International Film Festival. There were two showings of both to packed houses. The audience included the families and friends of those who died in police custody. They sat in an emotionally charged first screening. Some of the audience wept, others were angry at the brutality of the police officers and the inhumanity of the judicial system. Throughout there was pin drop silence, broken by cries of disbelief or shouts encouraging the struggles on screen. Many people were shocked at the deaths but they were also impressed by the courage and resilience shown by the families portrayed so powerfully in the film. At the end of the film the audience sat in a momentary contemplative silence and then participated in a lively debate featuring the families of Joy Gardner, Brian Douglas, Christopher Alder and Harry Stanley. Each family gave an update on what was happening in their cases and also on the coalition they had formed, the United Families and Friend Campaign, which the film had captured the birth of. People wanted to know how they could help. The families urged the audience to come and join the campaigns and gave dates of the next few major events. Many wanted to know how they could get the film shown in colleges and community centres across London, nationally and internationally. After Conway Hall the police strategy had become clear when they began to threaten every organisation, cinema or venue that wanted to show INJUSTICE with libel actions. They were trying to ban the film using intimidation. The film exposes human rights abuses which they believed they had covered up. It depicts the frustrations that families had experienced as every door they opened in their search for justice was slammed in their faces. The police were trying to use the same technique to try and gag the film. Our response has been to out manoeuvre their 'legal terrorism' and make sure the film lives on. In some senses INJUSTICE has taken on the spirit of the dead people who we are trying to help get justice for. Even as we struggle to show the film in cinemas, on the streets the deaths continue. On Thursday 12th July Andrew Kernan, was shot dead in Liverpool. On Monday 16th July Derek Bennett, was shot six times by police in Brixton. He was taken to King¹s College Hospital where he was pronounced dead. On the 17th July we arranged a press screening of INJUSTICE at the Cornerhouse Cinema in Manchester. The police solicitors wrote to us demanding the names of those who had been in attendance. We refused to give them the names in order to protect the journalists present. The number of officers they were representing had also increased and now included police officer Mark Tuffey, who had hit Brian Douglas with such force on his head that he fractured his skull causing his death and police officer Jackie Cannon who had sprayed CS gas in Ibrahim Sey¹s face as he was restrained by at least four other officers. The controversy over the film was increasing. On the 24th July the film was screened by the Metropolitan Police Authority, the body meant to oversee the police in London. The solicitors wrote to the MPA wanting them to stop the screening but it went ahead. After the screening the Police Federation, the organisation that was backing the officers in their legal action was told to "grow up" by Lord Harris the Chair of the MPA. Apart from Channel 4 News, television crews from Iran, France and Japan covered the story. Two days later, on the 26th July INJUSTICE was pulled hours before a public screening at the Cornerhouse Cinema in Manchester after legal threats but an alternative venue has been arranged so the film still filled the hearts of over 150 people in Manchester that night and many vowed to arrange other screenings. For us every person that sees the film is a victory. Now it is hundreds, soon it will be thousands. Then it will be millions. As the battle intensified we challenged the police to sue us and by the end of August they had gone quiet. Over the last few months Injustice has been screened in Vienna, Derry, Belfast, New York and Tehran. International Film Festivals have selected the film for 2002 and it has begun a cinema run in central London and across the UK. All these screenings have raised the issue of deaths in police custody to an international level and the families are also beginning to organise at an international level. The power of the film is in the words of the families. Towards the end of the film Brenda Weinberg, the sister of Brian Douglas, reflects the burning feelings felt in many audiences: "Dead is dead it's permanent, it's forever and wanting justice for that death is also forever. It's a forever wanting. I will always want it and will never rest until it's achieved. If it's meeting MPs, if it's joining groups or campaigning or fighting or making a damned nuisance of myself. That wanting of justice and eventually getting it is my goal because I can't grieve, I can't put Brian to rest, ever, if I know someone's walking around out there responsible for his death and they haven¹t been taken to justice. The only thing that does happen is that as the time gets longer it's any kind of justice. It can be legal justice or street justice. I don't really care anymore." INJUSTICE is a film that the world needs to see. It is as much a film about family love as it is about resistance. It is at the forefront of the struggles of the families who want to see the police officers responsible for the deaths of their loved ones prosecuted and convicted for their crimes. It is just a matter of time.